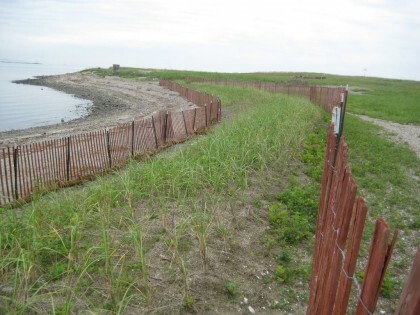 Volunteers – the general public and school groups – can help restore the shoreline at Stratford Point at two upcoming events for Earth Day sponsored by Sacred Heart University’s Department of Biology, the Connecticut Audubon Society, Audubon Connecticut, and the Rotary Club of Stratford. Students and faculty from Sacred Heart University’s Department of Biology are asking the public to join them as they plant marsh grass on April 22 from 10 a.m. to 4 p.m. at Stratford Point, the coastal area at 1207 Prospect Drive in Stratford. School groups with teachers can participate the following day, April 23, from 10 a.m. to 3 p.m. Volunteers and teachers can register for the events online at www.sacredheart.edu/earthday. The planting is part of an initiative to create a living shoreline at Stratford Point. Living shorelines control erosion through means such as reef balls – hollow concrete domes with holes that allow water and marine life to pass through. At Stratford Point, a row of these 1,000-pound concrete structures lessen the impact of waves, creating a protected area where marsh grasses can grow. The structures themselves become reefs teeming with underwater life and they also increase shoreline habitat and biodiversity. Stratford Point, a peninsula near the mouth of the Housatonic River, is an important stopover site for migratory shorebirds and wintering waterfowl, as well as dragonflies and butterflies. The Connecticut Audubon Society operated Stratford Point for approximately 10 years, ending in 2015. It is now operated by Audubon Connecticut, a chapter of the National Audubon Society.